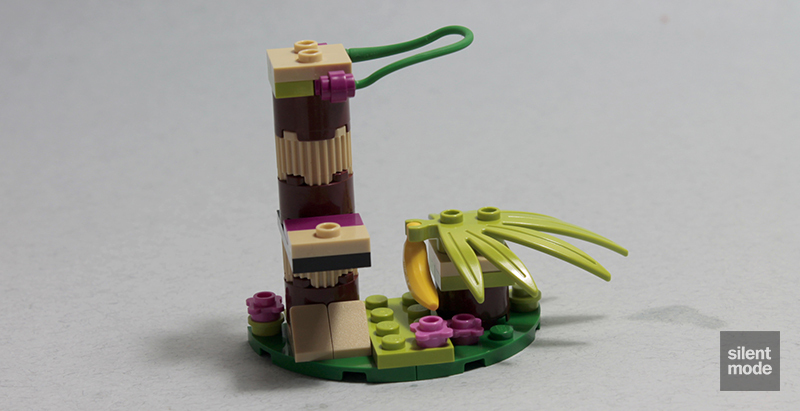 It’s time for a review of the second Series 5 Friends Animal Collectible, and today we’re going to be looking at the infamous Orang-utan (or Orangutan, as LEGO has spelt it) complete with its own Banana Tree… to form the all-powerful set, Orangutan’s Banana Tree. 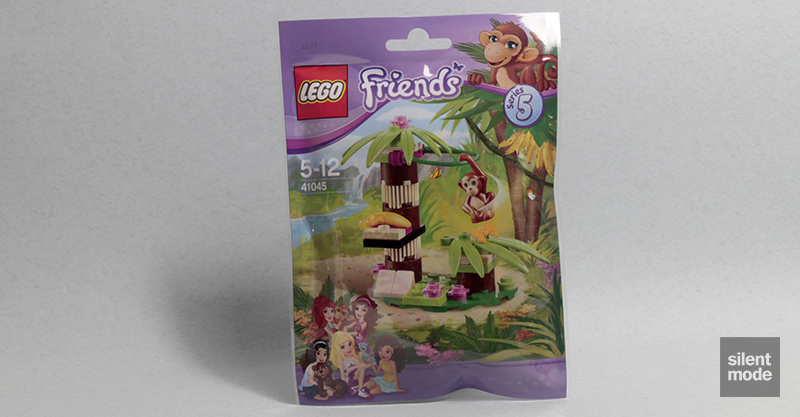 The feminine-looking orangutan in the top right corner is clearly just hanging around on the front of the packaging, demonstrating the set’s only play feature. 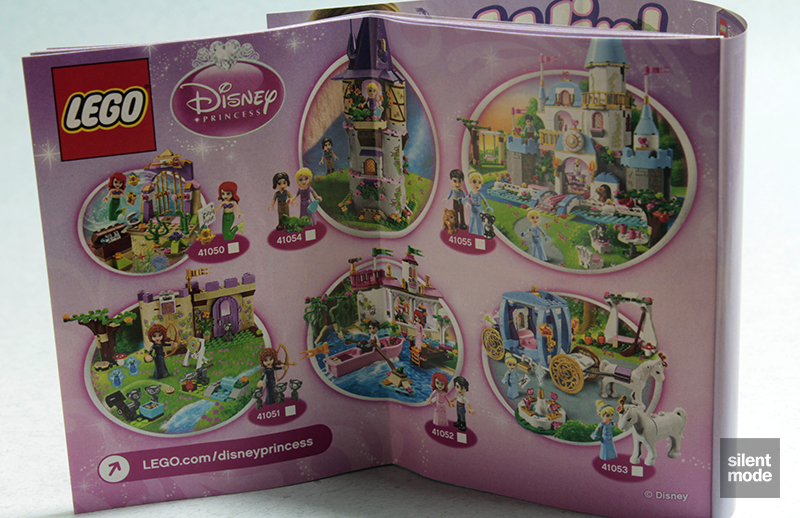 As with Macaw’s Fountain, the back of the bag shows an alternate build made using the set. Looking a bit skimpy this time around, here’s another chance to get a hold of swordleaf plant parts in Lime, and an opportunity to obtain two 2×2 grille round bricks in Tan (also appearing in Olivia’s Beach Buggy). Of note are that four of the 1×2 Tan jumper plates were the old variety, at least in this copy of the set: one of them is the newer variety with a groove at the bottom. Surprisingly the general preference is for the former. All in all, this selection of parts doesn’t seem very lucrative… but that Green whip in the bottom left may be a nice addition to Katharina’s dunge… I mean, riding camp. Wikipedia states that both “orangutan” and “orang-utan” are used to spell the word, but my browser’s spell checker prefers the hyphenated version for some reason. Anyway, apart from the gender-ambiguous Bright Light Orange bow – that for some reason goes on the animal’s back – this orang-utan is exactly the same as in Jungle Tree Sanctuary, and I’m sure in other places. It has a rather unnatural pose that allows it to both hang on to other elements and play features, and be carried by minidolls and minifigures. We only get one thing to build in this set, and it starts with another non-rectangular base made up of the two Green 4×4 round corner plates. Indeed, a similar technique as used in Olivia’s Beach Buggy begins to be used to make the trunk. That little platform at the bottom plays host to one of the swordleaf parts. Meanwhile, the tree trunk gets its own little “diving board” platform, and is reinforced with that Technic axle. We’ve reached the top and had to stop, and the incompleteness is bothering me. Let’s begin to remedy it by threading the Green whip into those two 1×1 Magenta plates with rings, to create a short vine. This is also where we sneak in that obvious banana. Once the tree trunk sprouts its own swordleaf, it’s time for the orang-utan to make itself at home. It stands at the top of its domain, eager to tell the world it’s a little teapot. The one play feature comes in the ability to have said orang-utan hang off of the vine, and maybe have it swinging as well. Witness the fitness. Another Bright Light Orange bow can be added to your collection, but otherwise there isn’t much of interest this time around. King Louie from The Jungle Book would be proud. If you know your parts and can figure out what goes where, this build is very simple without the instructions (which you can find over on the LEGO Friends website). Don’t forget that more Friends-compatible animals can be found in this year’s Disney Princess theme. 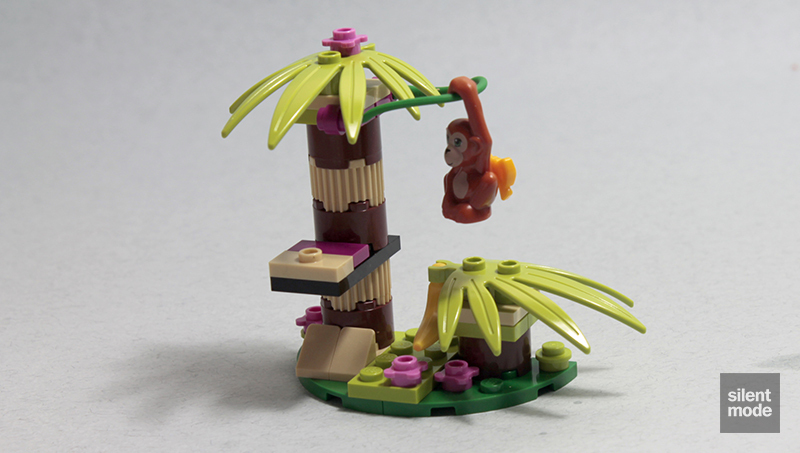 In keeping with this year’s jungle setting in the Friends theme, it’s cool that LEGO have opted to go for an orang-utan, rather than a generic monkey – even if it looks more like one than an orang-utan. As for the set itself, this is clearly one to buy if you want the chimp – I mean, orang-utan – for your collection, as there isn’t anything amazing about the parts selection. In fact, I’d recommend purchasing Jungle Tree Sanctuary if you want the featured animal. The one reason to buy this over the aforementioned set is for its more friendly vine action: it’s not as tricky to put together, and you can always have the orang-utan swinging on the vine in its small display placed in a corner. With that said, I’m giving this set 5.2/10.